For this card I used a beautiful Royal Blue Paper for my backdrop, as I wanted to emboss my snowflakes in white embossing powder. I made a frame for my sweet Christmas Tree, which is also styled and on foam dots. I added the Peace sentiment, and shadowed the "ace" portion to stand out against the white tree. And, not to disappoint, my signature sequins, crystals and pearls to finish. 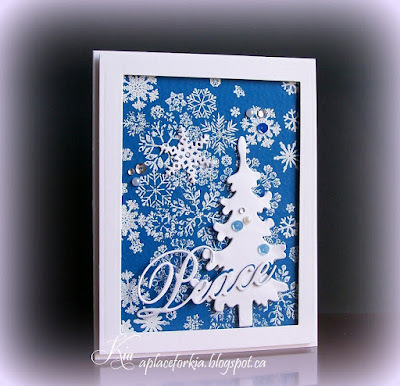 Products: IndigoBlu Snowflake Lace Stamp, Marianne Design Christmas Tree, Impression Obsession Small Snowflakes Set and Peace Die, Spellbinders Card Creator A&B. Oh, Kia, this is so beautiful, and I just love the blue and white! And I love your signature sequins (no disappointment here). What a beautiful framed piece this makes with the tree, and how perfect that you add the extra blue behind the "ace." Stunning, as always! Hugs!